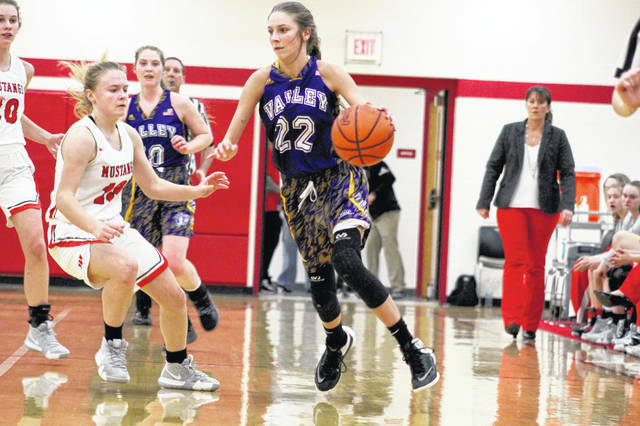 Valley’s Karsyn Conaway scored 11 of her 13 points during the first quarter of Wednesday’s 55-43 win over Westfall in a Division III sectional semifinal Jackson High School. 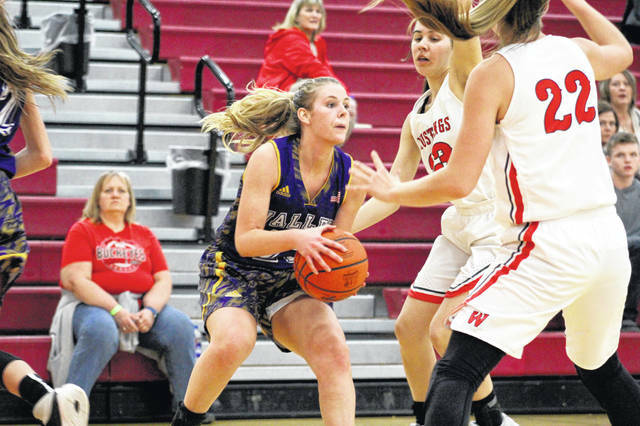 Senior Kaity Howard played a key role in Valley’s 55-43 win over Westfall in Wednesday’s Division III sectional semifinal Jackson High School. 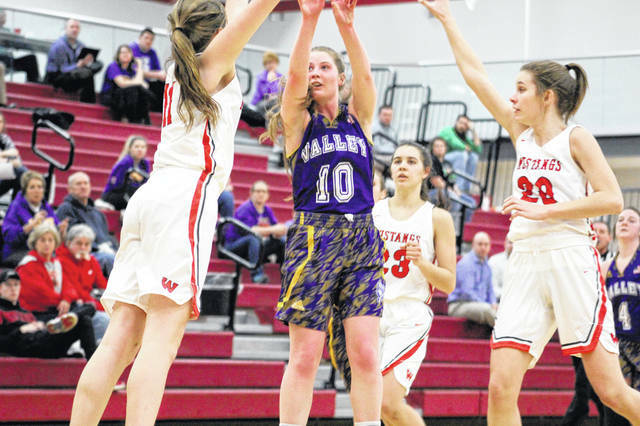 Valley’s Bre Call led the Indians with 17 points in Wednesday’s 55-43 win over Westfall in a Division III sectional semifinal Jackson High School. JACKSON — Karsyn Conaway early, Bre Call late, and Kaity Howard throughout 32 minutes. That’s the recipe Valley used to knock off Westfall by a 55-43 final Wednesday night in a Division III sectional semifinal at Jackson High School. A win is a win. But Wednesday’s win came with its fair share of takeaways. While the No. 10 seeded Indians (9-13) kept their season alive against a higher-seeded Westfall team, they also made mistakes, got away from their original strategy and committed 20 turnovers. But early on, that wasn’t the case. Behind hot shooting from Conaway, Valley sprinted out to a 14-5 lead. By the end of the first quarter, Conaway had 11 points and the Indians had a 23-8 advantage. That 15-point edge held strong throughout the rest of the first half as the Indians held a 31-16 lead at the break. But Merritt’s concern was that his team didn’t build upon the early success. The bottom line is that Valley’s season lives to see another day. One reason for that is the play of seniors Kaity Howard, Bailee Day and Chalee Hettinger under the basket. That trio combined for 20 points and 24 rebounds while giving Valley a plethora of second chances to score. Call led the Indians with 17 points and six assists as Conaway finished with 13 points. Howard added her 12 points and eight rebounds to the mix while Hettinger ended with five points while Brooklyn Buckle had four. Both Hettinger and Buckle had a team-high nine rebounds. Dudgeon led the Mustangs with 21 points and 12 rebounds while Mahaley Farmer added nine points and six rebounds. Marissa Mullins also chipped in for Westfall, scoring six points. The Indians advance to face Fairland, a 52-13 winner over Zane Trace on Wednesday, in a Division III sectional final at 2:45 p.m., Saturday at Jackson. Valley: 22-60 FG, 9-15 FT, 3-15 3pt. (Conaway 3), 36 rebounds (Buckle 9), 20 turnovers, 13 assists (Call 6). Scoring: Call 17, Conaway 13, Howard 12, Buckle 6, Hettinger 5, Day 2. Westfall: 12-58 FG, 17-29 FT, 2-16 3pt. (Mullins 2), 37 rebounds (Dudgeon 12), 21 turnovers, 4 assists (Henry 4). Scoring: Dudgeon 21, Farmer 9, Mullins 6, Patete 3, Kitchen 2, Henry 2.